Indianapolis, Indiana – In the matter of Orbitz, LLC v. Indiana Department of State Revenue, Orbitz, LLC of Chicago, Illinois was heard by the Indiana Tax Court on its request to prohibit public access to information in the court record. The court granted the request, holding the trade secrets contained in documents submitted to the court were protected against public disclosure by both the Access to Public Records Act (Indiana Code § 5-14-3-1 et seq.) and Indiana Administrative Rule 9. Orbitz, an online travel company, provides travel-related services on its website that enable its customers to search for and make reservations for a broad array of travel products, including airline tickets, lodging, rental cars, cruises and vacation packages. The broad issue in this Indiana-state tax appeal was the appropriate base on which to calculate the Indiana state and local taxes due. Generally speaking, a hotel will contract with Orbitz to make its rooms available for reservation through Orbitz’s website. Pursuant to the contract, the hotel agrees to accept a certain amount for its rooms (“net rate”). Nevertheless, a customer who books a room through the website sees – and ultimately pays – a different amount, as Orbitz has added a facilitation fee, a service charge, and a tax recovery charge to the net rate. The tax recovery charge is equal to the amount of state and local taxes due on the room’s rental at the net rate. After the customer has occupied the room, Orbitz forwards to the hotel the portion of the payment it collected from the customer that constitutes the room’s net rate and tax recovery charge. The hotel is then responsible for remitting to the taxing authorities the appropriate state and local taxes due on the room’s rental. Following an audit in which the Indiana Department of Revenue found Orbitz to have underpaid the taxes due, Orbitz brought this appeal. Orbitz argued to the court that tax was due only on the net amount paid by Orbitz to the hotel. The Indiana Department of Revenue, in contrast, maintained that Orbitz had been deficient in remitting Indiana’s gross retail (sales) and county innkeeper taxes on the hotel bookings at issue. It contended that the total amount paid by the customer to Orbitz for the room was the correct figure on which to base the Indiana-state tax. When asking the Indiana Tax Court for summary judgment, Orbitz also asked that the court prohibit public access to its contracts with the Indiana hotels, stating that the contracts were “proprietary [and] competitively sensitive” and that they contained trade secrets belonging to Orbitz. The general rule in Indiana is that the public has access to court records. Citing the Access to Public Records Act, Ind. Code § 5-14-3-1, the court stated “all persons are entitled to full and complete information regarding the affairs of [their] government.” However, in certain circumstances, that right of access is restricted. An example of such a circumstance is when materials submitted to the court qualify as a trade secret. Trade secrets are protected from disclosure by statute in Indiana. 4. that is the subject of efforts, reasonable under the circumstances, to maintain its secrecy. When, as here, the documents sought to be protected fall within a mandatory exception set forth in the Access to Public Records Act or Indiana Administrative Rule 9, a court can seal those records without holding a hearing and balancing the competing interests. However, in other cases, when issuing an order to shield information from public access, the court must specifically outline why the need for privacy outweighs the strong public policy to allow such access. This appeal was argued by Indiana tax attorneys Larry J. Stroble, Randal J. Kaltenmark, Howard E. Kochell and Ziaaddin Mollabashy of Barnes & Thornburg LLP and Illinois tax attorneys Catherine A. Battin, Elizabeth B. Herrington, Aron Frakes, Megan Thibert-Ind and Jeffrey A. Rossman of McDermott Will & Emery LLP for the Petitioner. It was argued by Jessica E. Reagan and Thomas D. Cameron, Deputy Attorneys General of Indiana for the Respondent. 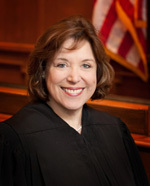 The case was assigned to Judge Martha Blood Wentworth (pictured) in the Indiana Tax Court and assigned Case No. 49T10-0903-TA-10.